Want to take your DIY project to the next level? How about making a DIY planter that also is a bird feeder? Take a look below at three inspiring ideas. DIY designer/decorator Beth from Home Stories A to Z has come up with a brilliant project to turn seven normal clay pots into a one-of-a-kind outdoor work of art. Taking advantage of a clay pot's unique design, Beth created a fun centerpiece that can turn any backyard or garden from stale to whimsical! Using seven clay pots, which you can easily find for a reasonable price at any hardware store, and a little paint, you can create the base of your topsy-turvy planter/bird feeder. Beth used some bright blue paint to give the whole thing a little bit of flair, but you can use different colors or even paint a pattern on each pot for even more individuality. The brilliance of Home Stories A to Z's design is that one small rebar stuck into the ground is all you need as the foundation of the structure. Depending on the length of the bar, the amount of pots you use is entirely up to you! A little dirt in each pot and a couple flowers of your choosing make this customizable. And for detailed instructions, check out Beth's website. Top off your tower of potted plants with a bird feeder or birdbath to make it a miniature nature sanctuary! Fun and whimsical, this project instantly breathes new life into any garden, backyard or front yard! Love mosiac tiles? In this second project, teacups are used as planters against a beautiful mosiac background. 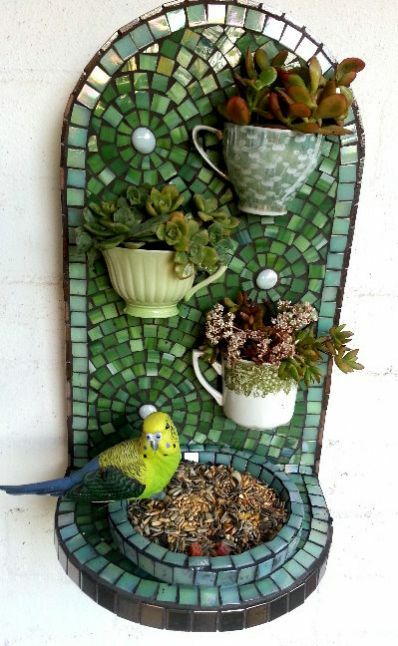 A third creative way of making a DIY bird feeder planter is to re-use old items around the house. 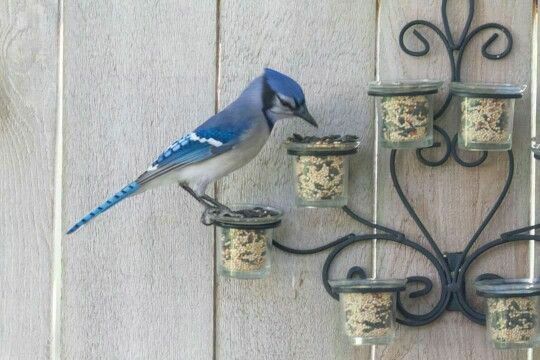 This project by Charter House Interiors shows how to repurpose old tealight candle holders as a bird feeder. This isn't shown in the image, but each candle holder can also be repurposed as a planter as well. 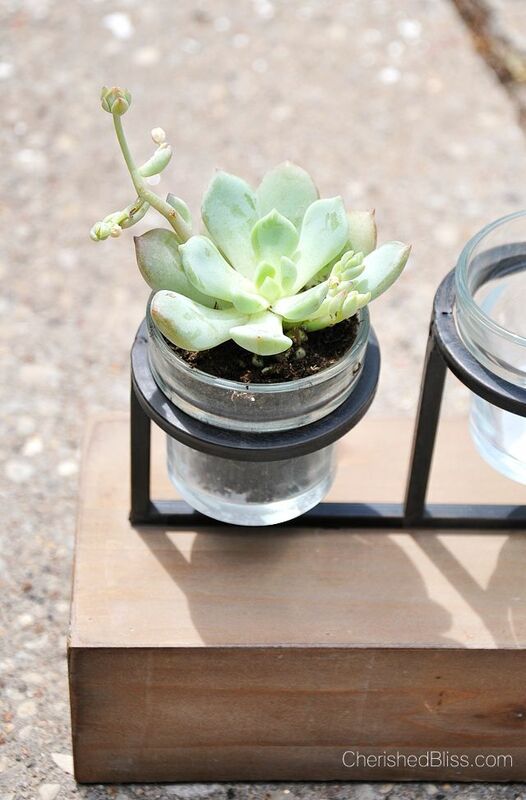 For example, you can add succulents, like the one below by Cherished Bliss. Do you know of an avid gardener who might like this or someone who could use a little bit of help with their garden? Please SHARE!